Xiaomi Handset Codenamed Libra Leaks As Mi 4c; Snapdragon 808 In Tow? 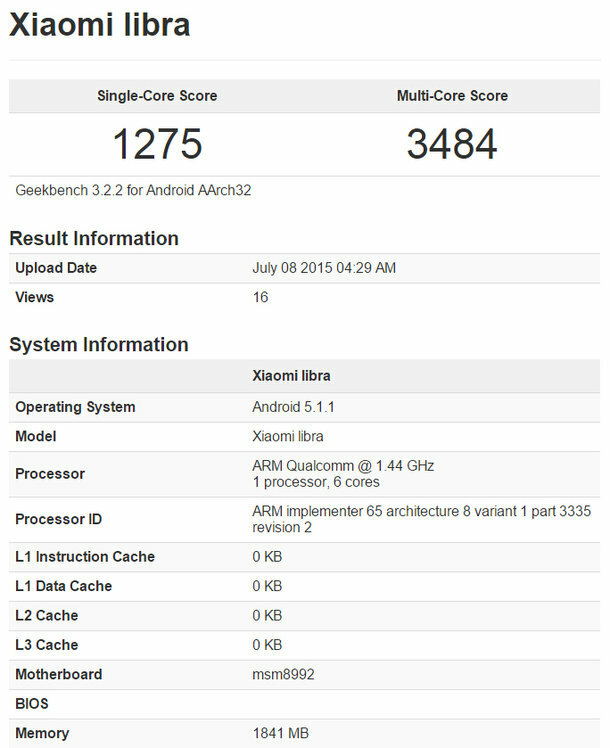 Not long ago, a Xiaomi handset codenamed Libra had its specifications popped up courtesy of Geekbench. According to the details, the smartphone was sporting a Snapdragon 808 SoC. Now, the latest leak reveals that the upcoming device possesses an actual model name; Mi 4c. Yes folks, that is correct; looks like we finally we will finally be bearing witness to Xiaomi’s first ever mobile device that is going to be running Qualcomm’s Snapdragon 808. However, on this occasion, Xiaomi Mi 4c was shown to be running six cores of Cortex-A53 at the aforementioned clock speed. Perhaps Xiaomi is well informed about Cortex-A57; that it consumes 256 more power compared to Cortex-A53 and is unable to deliver the performance according to the ratio at which it consumes battery life. According to the source, Xiaomi is gearing up to announce its Mi 4c tomorrow, which is only three days before the company announces its Redmi Note 2, a handset powered by MediaTek’s MT6795 SoC. Mi 4c could very prove to be the successor of the company’s Mi 4i, a device sporting a Snapdragon 615, and does not come close to the capabilities of Snapdragon 808. While there were no pricing details surrounding Mi 4c, we have a feeling that it is going to carry a sub-$200 price in order to keep up with the remaining competition. Since the leakster stated that there is a high chance that the smartphone is announced tomorrow, let us keep our fingers crossed and see if Xiaomi will add another device to its smartphone portfolio.